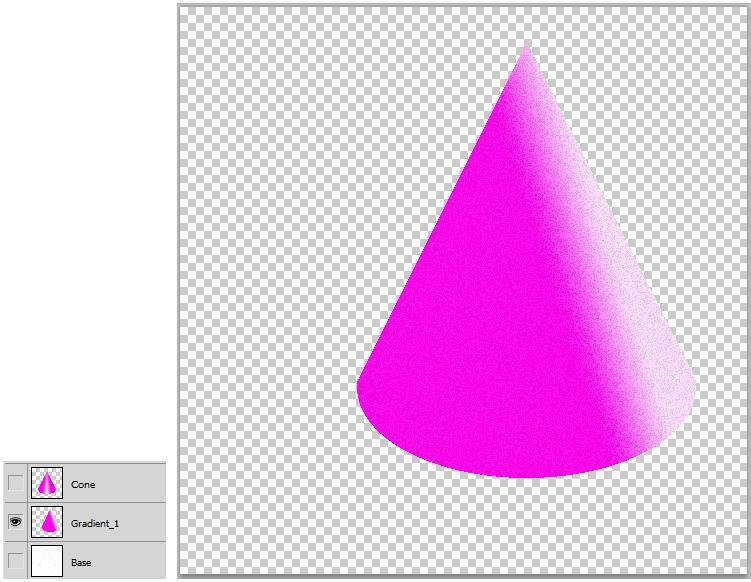 In this tutorial, you will learn to make Cone primitives in Photoshop. 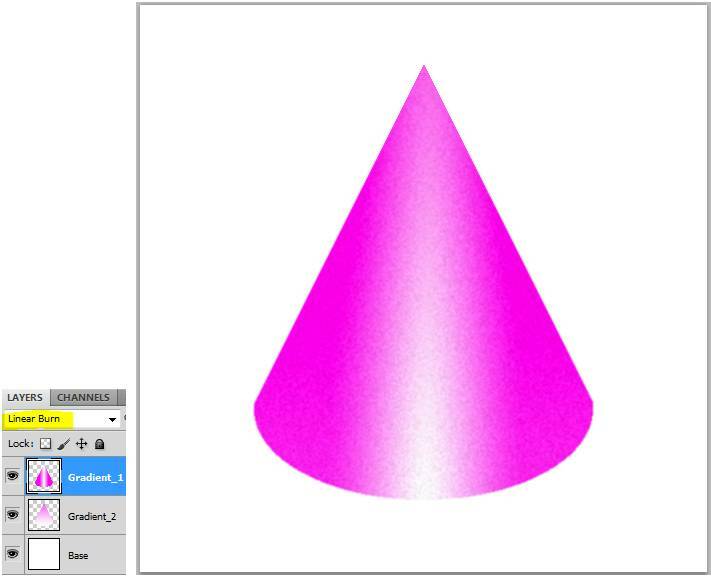 You could hand draw and paint a cone if you are a good artist, but by using gradients and outlines, you can create realistic images with depth. 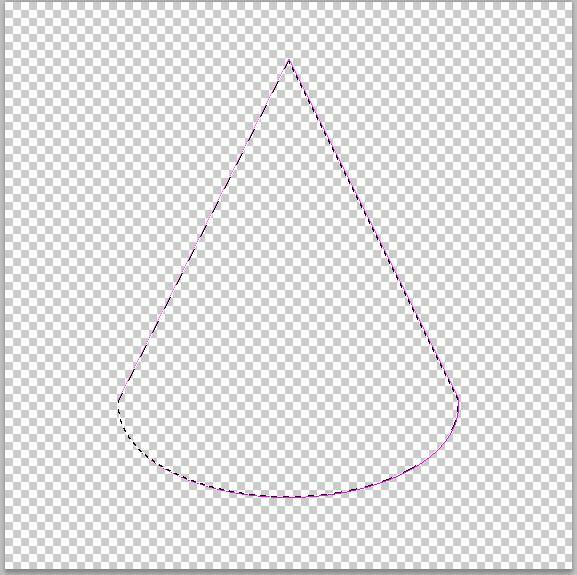 First use the Line tool and Elliptical tool to make the outline. 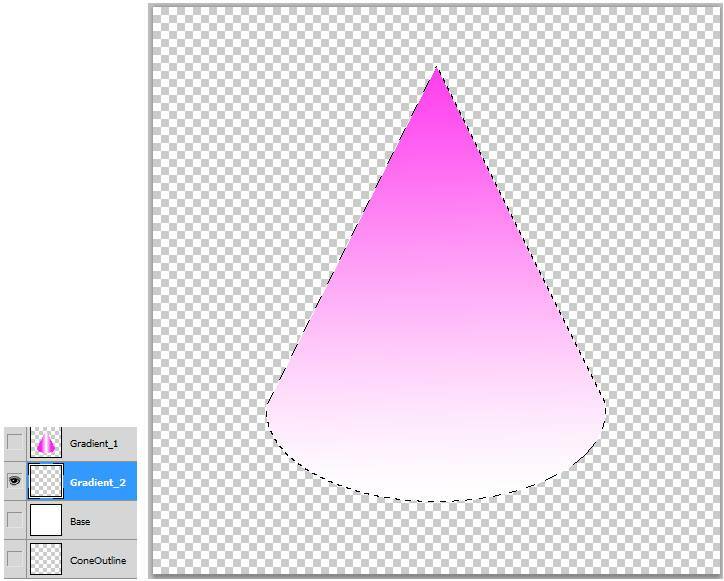 Two Linear Gradient layers and a white base layer is all it takes to make the Cone stand out with a shiny middle. 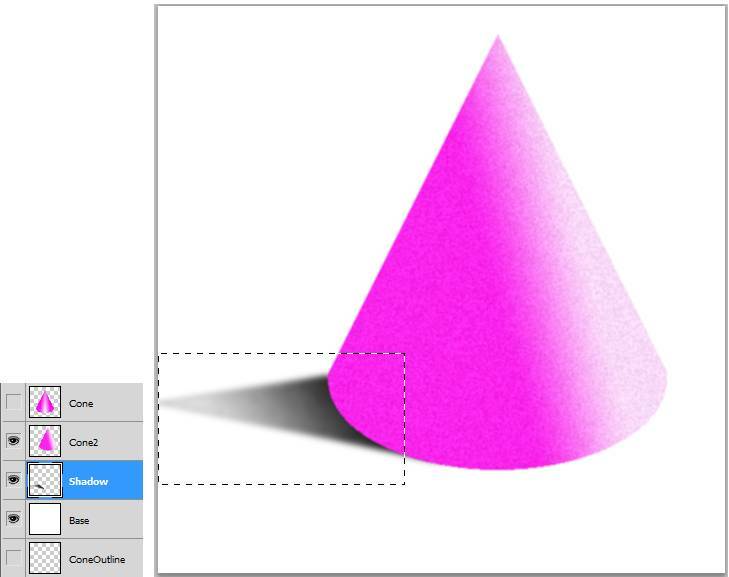 Change the gradient direction on the cone and add a shadow for a more convincing view. 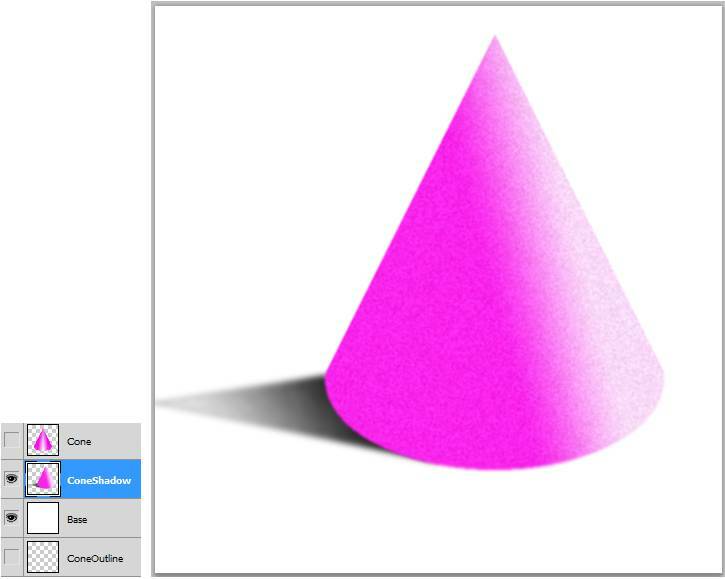 The transparent version uses the original Cone layer, and two Linear Gradient layers. The Opacity is turned down on all three layers to bring out the transparency. Open a new Photoshop project, 20x20cm square, and fill with white. Name the layer Base. On the menu, go to View/Show/Grid. Go back to View and check Snap. Change the foreground to a light pink. 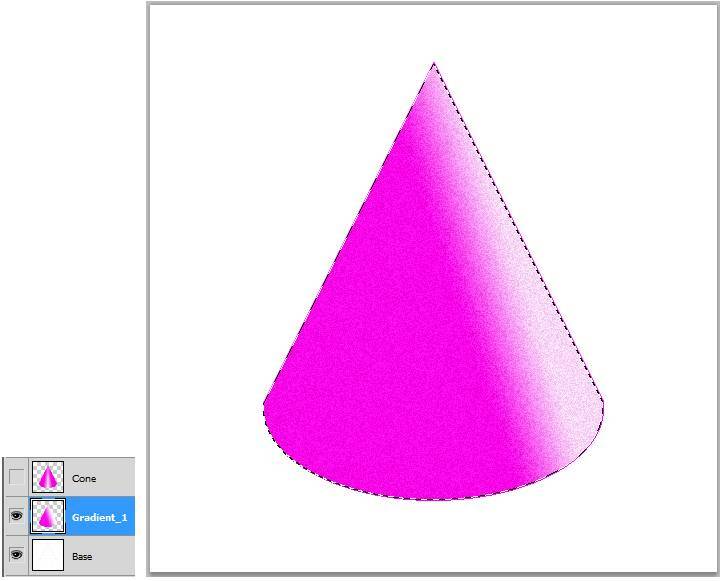 This color will be for the outline and gradient of the Cone object. 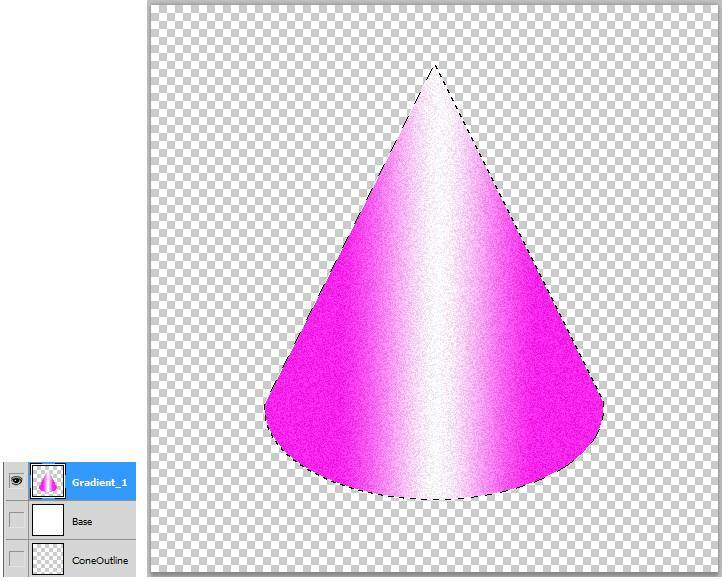 Create a new layer called ConeOutline. 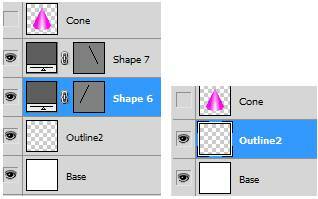 On the ConeOutline layer, use the Elliptical Marquee Tool to make an oval selection at the bottom of the layer. On the Menu, go to Edit/Stroke. Choose a 1 pixel width. This will fill the outline of the Cone base. Cut the top half. Go to the Rectangular Marquee Tool, make a selection and press Delete. 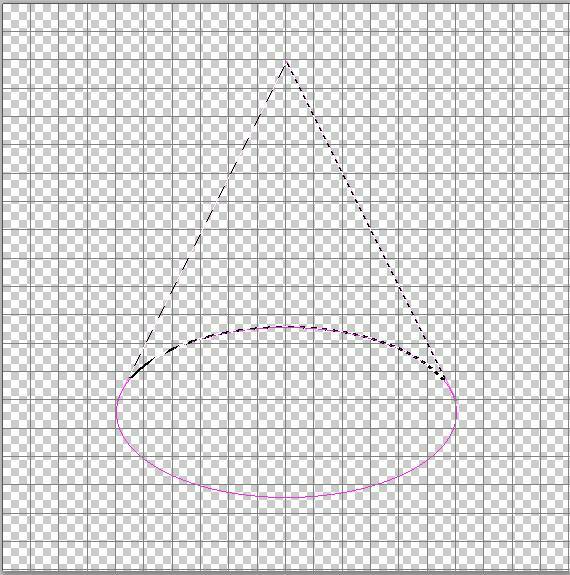 With the Line Tool, 1 pixel size, draw the two lines to complete the Cone outline. Collapse the line layers into the ConeOutline layer. Merge them both down. Create a new layer above the Base. Call it Gradient_1. Move the ConeOutine to the bottom. 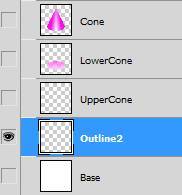 Go back to the ConeOutline layer. Click on the Magic Wand Tool. 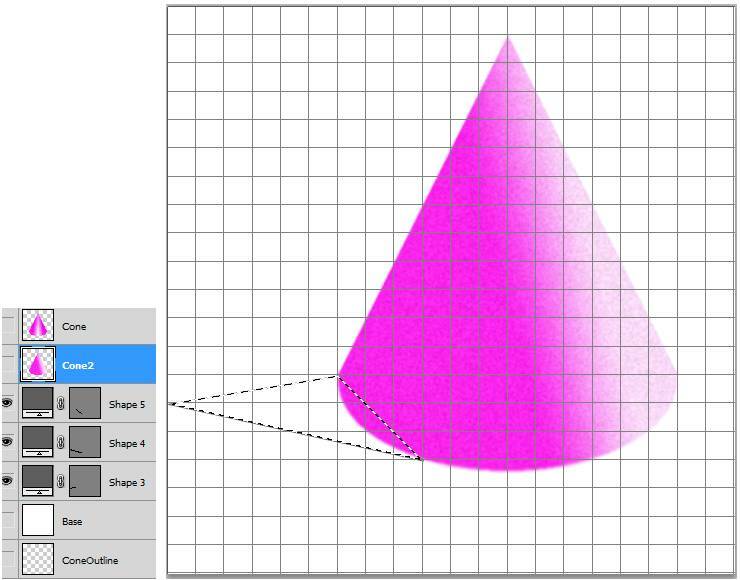 Click inside the Cone outline to make the selection. Go back to the Gradient_1 layer. Click the Gradient Tool. Choose Reflected Gradient. 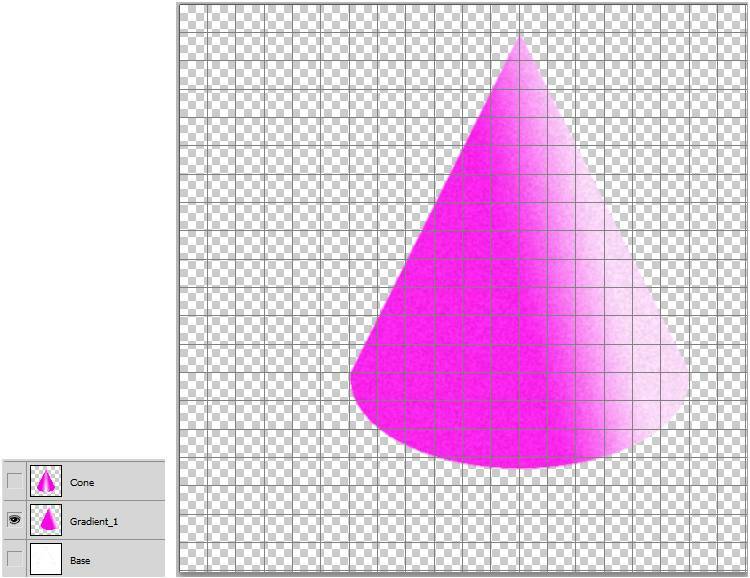 Drag the mouse horizontally in the top middle of the cone selection, but not too far. This will create a nice gradient with a shiny middle. On the menu go to Filter/Noise. Add some noise. This will give the Cone a spray painted look. 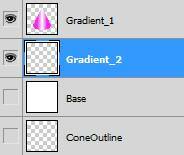 Create a new layer called Gradient_2 above the Base. 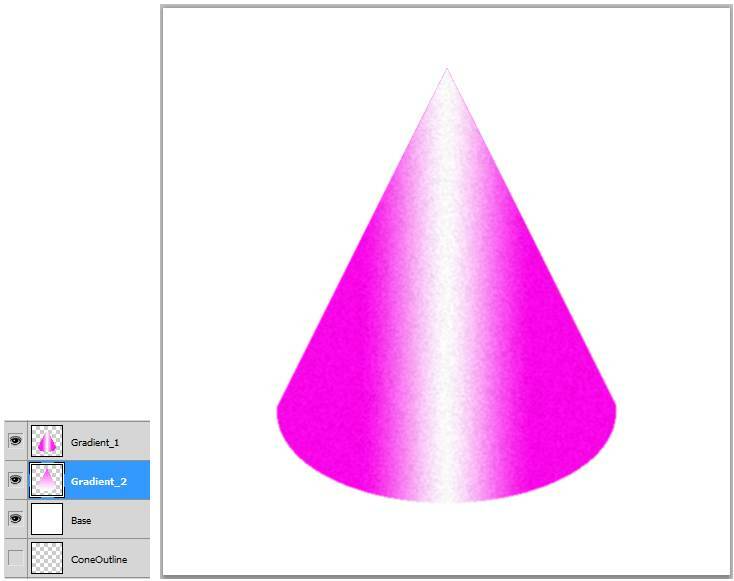 Go back to ConeOutline and use the Magic Wand to click inside the outline to make a selection. Back to the Gradient_2 layer with the selection area. Click the Gradient Tool. Choose Linear Gradient. Create a gradient that is darker at the top. Turn on all the layers except for the Outline layer. Put a Linear Burn on the Gradient_1 layer. This will make the top of the cone not so bright. Merge the gradient layers into one. 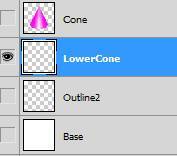 Rename the layer Cone. 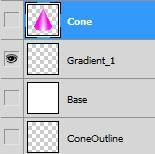 On the Cone layer go to Filter/Blur/Blur More. This will make the edges and pixels more blended. 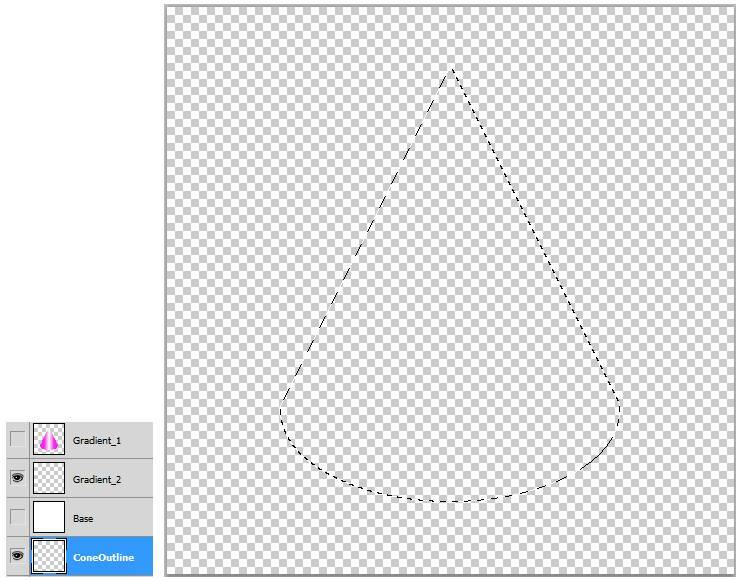 Use the Magic Wand tool and click a selection inside the outline. Reuse the Base layer. 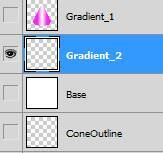 Create a new layer Gradient_1. 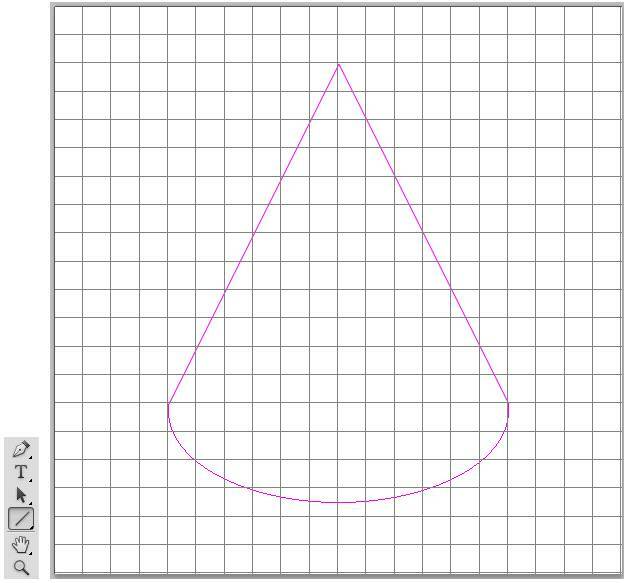 Drag the mouse at an angle on the right side of the cone selection. Keep trying until you get a nice gradient with a shiny right side. On the menu go to Filter/Noise. Add some noise. 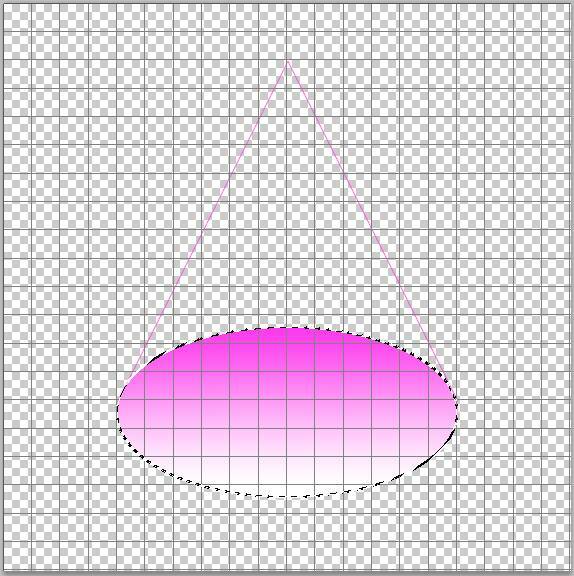 Use the Move tool to move the cone in the Gradient_1 layer to the upper right. On the menu, go to Filter/Blur/Blur More. This will smooth the edge pixels. 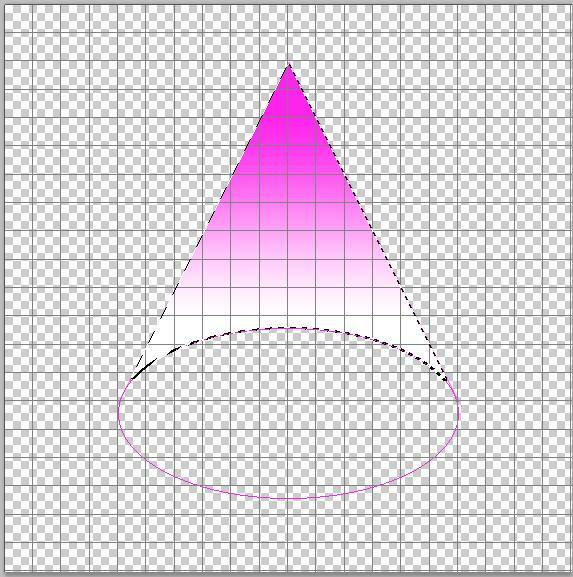 Use the Line tool to draw a triangle to the left of the Cone as seen below. Use a light gray color. Merge the three line layers. Rename it Shadow. Stay on the Shadow layer. 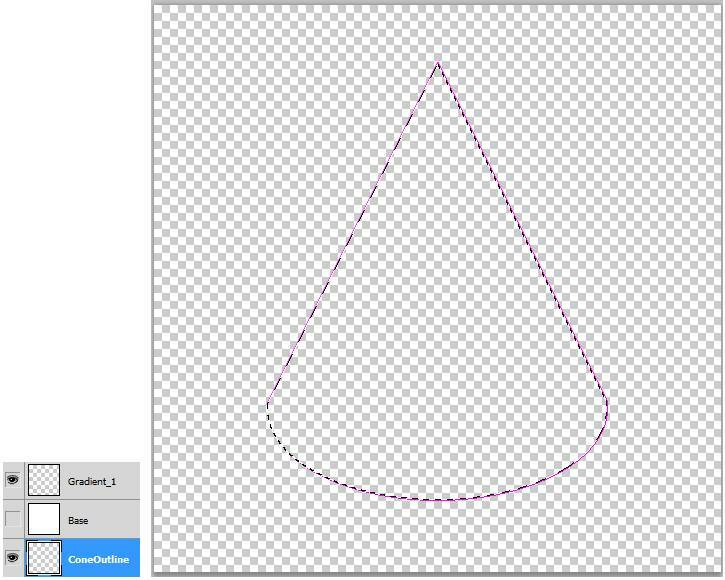 Use the Magic Wand to click inside the outline. Make a grey gradient. Choose Linear Gradient. Create a gradient as seen below. Add a Noise filter. 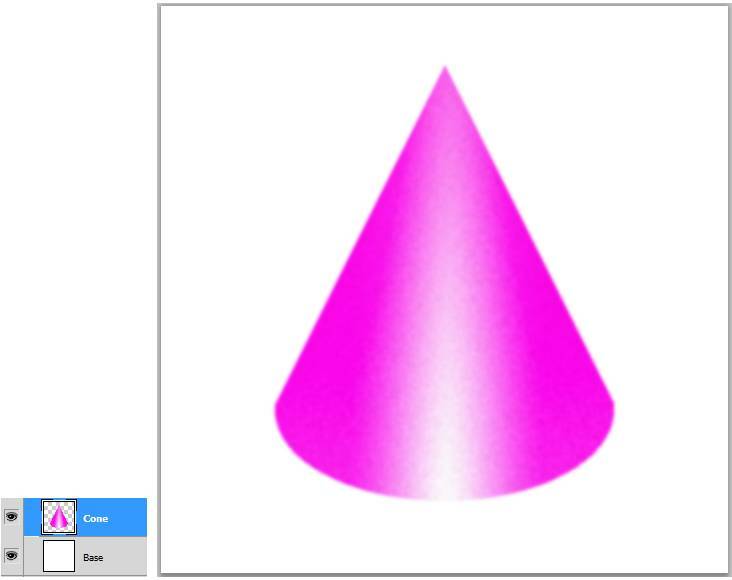 On the Shadow layer, make a square selection on the shadow go to Filter/Blur/Gaussian Blur. Merge the Cone2 layer down on the Shadow layer. 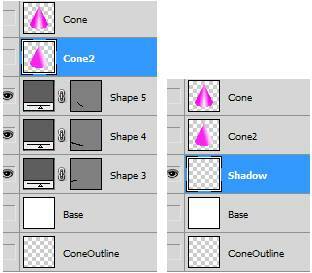 Rename it ConeShadow. We will Reuse the Cone and Base layers. 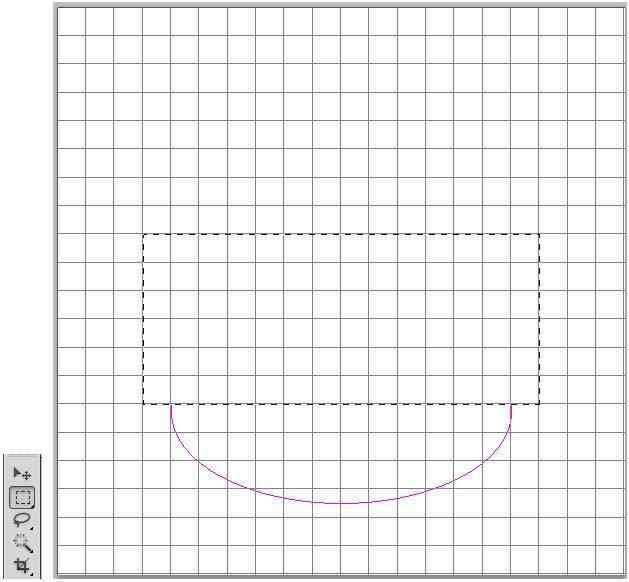 Use the Elliptical Marquee Tool, and the Line tool to create the outline below. 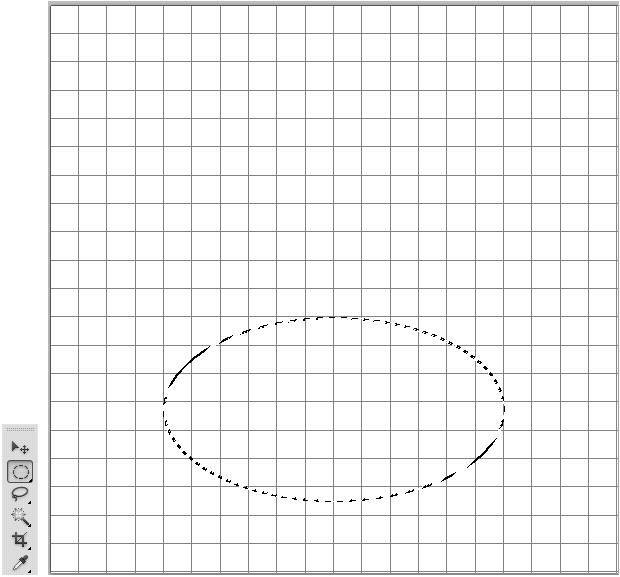 Create the oval in the Outline2 layer. 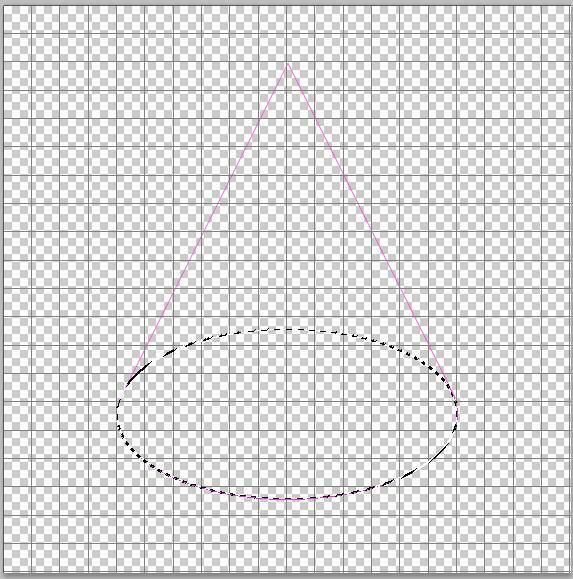 Merge Down the two line layers into the Outline2 layer. 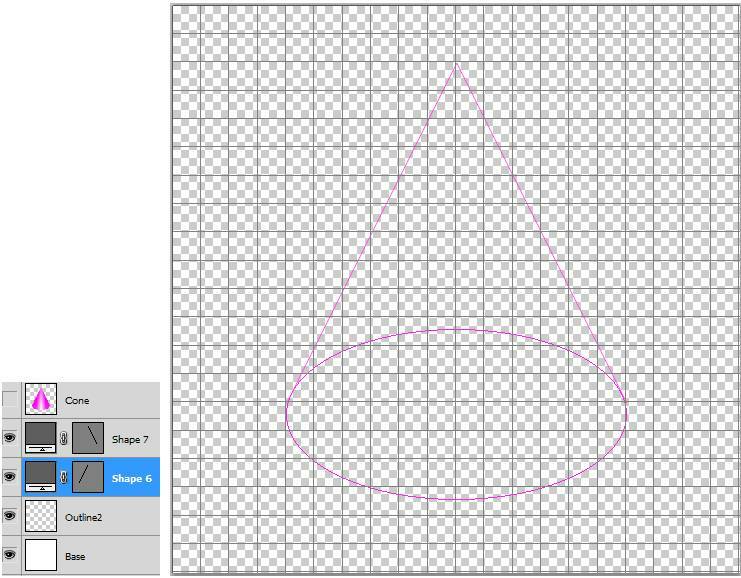 Create a new layer LowerCone above the Outline2 layer. 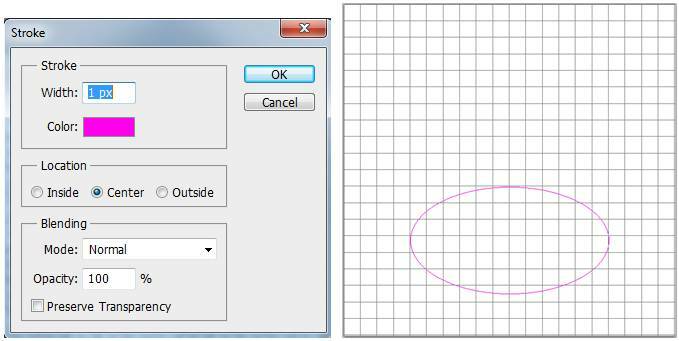 Go to the Outline2 layer, click inside the oval area with the Magic Wand. Go back to the LowerCone layer. For the oval selection, use a Linear Gradient, dark at top and light at the bottom. 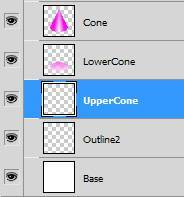 Create a new layer named UpperCone. Go back to the Outline2 layer. Click inside the upper cone area with the Magic Wand. Go back to the UpperCone layer. 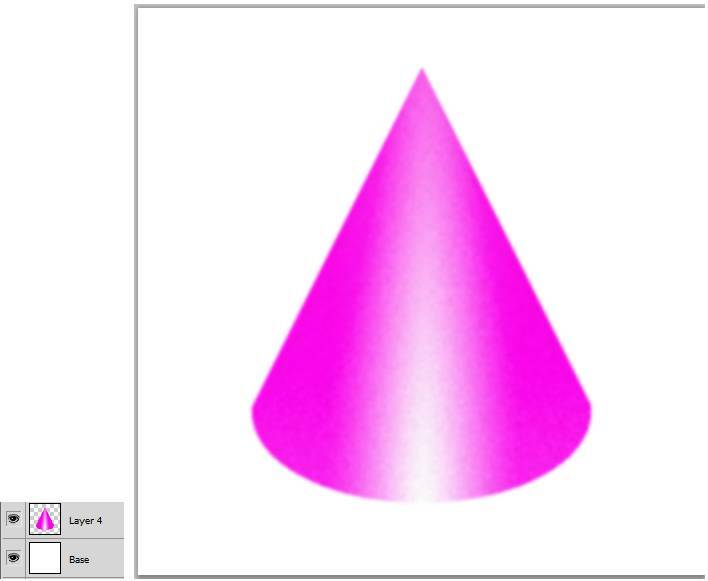 For the upper cone selection, use a Linear Gradient, dark at top and light at the bottom. Go to the top three layers one at a time and on the menu, go to Filter/Gaussian/Radius=3 pixels. Turn off the Outline2 layer. Change The Opacity of the top three layers until things look right. 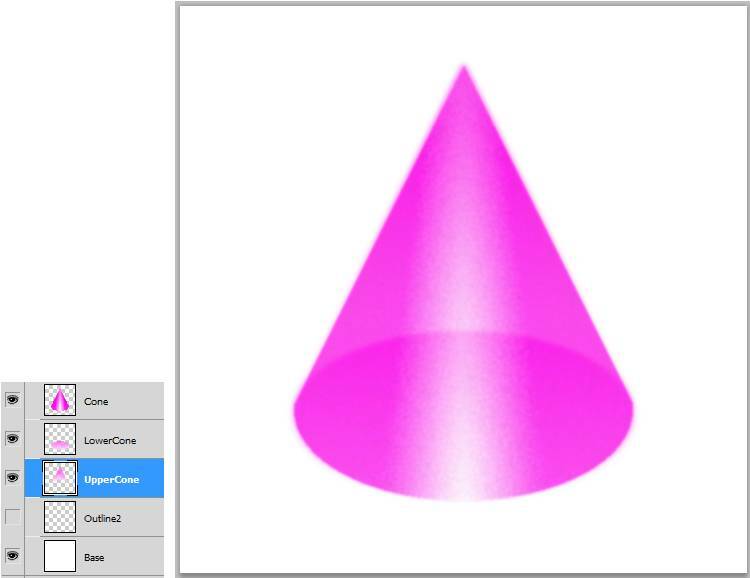 Now we have the final transparent Cone. Create a Cube in Photoshop.